Hats. We all know they are important but if you are like me it is always the thing you forget to do, put on your hat! I suppose I just always saw hats as annoying and hairstyle ruining! Now I am the total opposite, if I am outside, I more than likely have on a hat. I find now there are too many options for me! From practical to fashionable I am now spoilt for choice. So this article is for the gents, the dads, brothers, boyfriends, and husbands and everyone else is between. 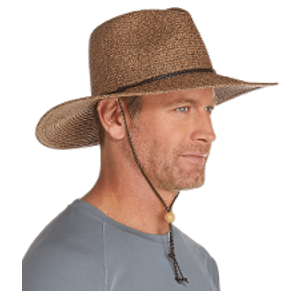 You know hats are important for protecting your head, face, and neck when you are out on adventures, or just lazing around the yard, so that’s why today we are going to check out the best men’s sun protection hats. So gents, you might be thinking, do I REALLY need a hat? Well… yes. Sunscreen will protect you from UVA and UVB rays, if it is broadspectrum, and if you remember to reapply after 2 hours and reapply after swimming and reapply… you get the gist. Sunscreen will also only protect you at the surface of the skin, so lets not let it get there in the first place. After thorough research into what makes a Sun hat great, SimplySunSafe recommends the Columbia Sportswear Bora Bora Booney II Sun Hat as the best men’s hat for sun protection. Read on for a our in-depth buyer’s guide, comparison table, and reviews of the top 5 best sun protection hats for men. Bucket Hat – as described these hats have a deep crown and a wide, downward slanted brim, like a bucket popular among fisherman, they provide your ears, face and neck much needed shade. Commonly found in heavier fabrics but there have been some lightweight options available. 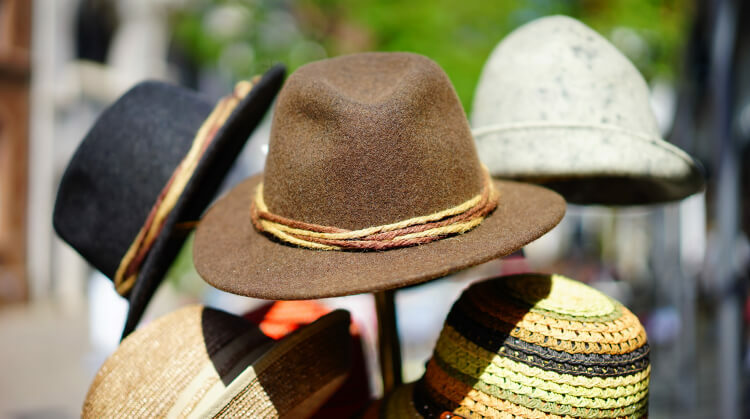 Broad Brimmed Hat – these guys have a large brim around them, providing stacks of essential shade for your face, neck and ears. Commonly available different fabrics and materials including straw and canvas. Lots of guys can be found wearing these on holidays laying on the sand having a cerveza. Legionnaire Hat – I know what you’re thinking… ‘yeah right’ but they provide so much protection! They have a flap that covers your neck, ears and side of your face giving you extra protection that a standard cap. Yes, you most likely won’t be meeting your dream girl or guy in this one but really good for protecting your skin. Baseball Hat – Sorry gents as these don’t provide you with any protection to your ears, face or neck I don’t recommend them. For some additional information the SunSmart fact sheet gives some recommended brim measurements which may assist you on your hat hunt. Well firstly you’ll have to think about what activity you want to undertake when you are wearing your new hat as this will determine which hat will be the best option for you. Hiking, gardening, surfing or kayaking. The options are endless. UPF stands for Ultraviolet Protection Factor and tells us how much of the sun’s ultraviolet rays will penetrate your clothing and reach your skin. Additional information on UPF in clothing can be found at the Skin Cancer Foundation’s website. You always want to purchase UPF rated clothing however, if you have a favourite hat and want to see how it measures up protecting you from the sun, the above website provides valuable information to assist you in ensuring your favourite item provides optimal sun protection. As I mentioned earlier wet clothing, including hats, reduce the effectiveness of your clothing. The UPF rating of a sun hat will be reduced if it becomes wet. If you’re going to be jumping into the water to cool off, or if catching a few waves is on your to do list making sure your sun hat is made from quick-dry material will ensure your sun protection is back to its best as quick as possible. We all want the best quality for the smallest outlay so this I will also explore different price options for you. Don’t despair, there are lots of high quality and cost-effective options. Yes guys I know, you don’t want to look too dorky while protecting yourself from the sun. Yes, some sun hats may be not as on trend as you would like but just remember, there is nothing unfashionable about protecting yourself from the sun. This helps you keep cool by allowing heat to escape. This will be important if you’re undertaking a strenuous activity like rock climbing or hiking. 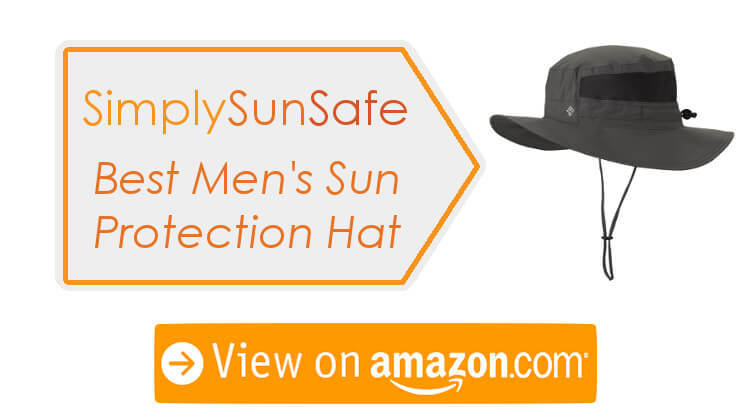 After thorough research that combined discussing issues with customers, reviewing customer feedback, examining manufacturer specifications, participating in safe sun practices forums, SimplySunSafe has chosen the 5 best sun hats for men. These sun hats provide a great UPF rating, are reasonably priced, explore ventilation options, come in different fabrics depending on the activity you want to undertake, and some have fast trying ability for those of you wanting to take a dip. I just can’t get past this hat, this one is the ultimate all rounder! A huge UPF 50 rating will block out 98% of the sun’s rays. Its ventilation and cooling functions include a sweatband plus a mesh vent panel to help heat escape. For sizing it’s only available in the one size but it does have an adjustable drawcord that will make sure it fits nicely as well as a chinstrap for additional security. Thinking about going for a dip? No problem! This guy is fast drying meaning it will be back up to its maximum UPF protection in no time. So that all sounds great, what about the cost? Well! That’s where this hat just kept coming out on top. It is so reasonably priced that it continues to be my champion of sun hats. Coming in at a super close 2nd, this sun hat is super fashionable for the gents. It’s wide brim gives you have great protection on your entire face. It’s rated at a big UPF 50 for maximum protection. This hat is made out of polyester which makes it light and breathable. On top of that it has an internal sweatband and ventilation holes. There are 4 color options, and for sizing there are 3 options to choose from to make sure it fits nicely. This hat can be used for almost anything, it also has a chin strap to stop it from blowing off your head if the weather turns bad. If you do want to go for a quick dip this hat is water resistant. The reason this one didn’t come out on top was the price, it was more expensive than out champion, but if budget isn’t a consideration this hat is definitely worth a second look. Get Coolibar Shapeable Wide Brim Now! You had to know one of these was coming! While it’s not the most stylish hat on the market it it makes up for it in comfort and practicality. Intrigued?? The Lenikis hat is ready to go on every adventure with you! Think of the possibilities in this guy… hiking, walking, rock climbing and kayaking I think you get me… they’re all covered. 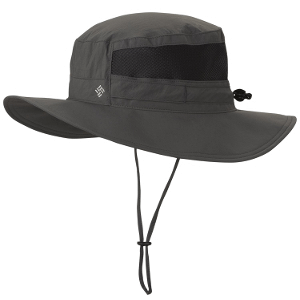 Features include a large brim and neck flap meaning your head is entirely protecting from the sun’s UV rays. This product did not rate higher on the list simply because of its style. No, you may not get a first date wearing this but there’s no question you’ll be protected from the sun! Honestly, the cost is so great with this one that if you can look past the style you might even consider getting two! 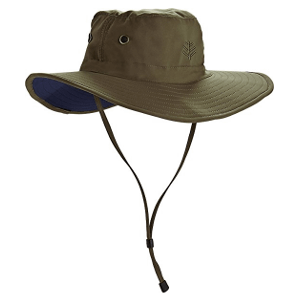 Get Lenikis Outdoor Activity Hat Now! Finally! I heard you. A straw option for those of us guys that want to lay on the beach, or cook a BBQ while watching game, or take the dog for a walk. I had to add in a straw hat in my article for best men’s hats for sun protection. To me they just scream relaxation and lazy pool days. Again I’ve picked a Coolibar hat because they really are amazing. 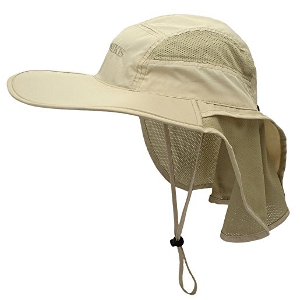 This hat is rated UPF 50, although they do state that due to the weave of this item, small areas may provide less than UPF 50 so make sure you are using your sunscreen too. The chin cord will stop this one from flying off your head and the crown is cotton lined and has a sweatband to help with cooling down. To make sure it fits you nicely there are 4 sizing options and it also comes in 2 colors. Unfortunately this hat is probably not ideal to get wet as it’s made from a paper and cotton blend it’s also at the upper end of the price scale for those of you budget conscious adventurers out there. Get Coolibar Beach Comber Now! Yes, yes I know, another one with a neck flap. But seriously, this hat’s got a nice big brim to ensure you have plenty of shade and it’s available in solid and mesh styles so you get to choose on how much ventilation you want! The fabric wicks away moisture from your head so you won’t be covered in sweat. It also has a chin strap to ensure this guy is not flying anywhere! This hat is also available in a huge 24 color options! There are a couple of downsides to this hat. It isn’t UPF rated so you can’t measure how much sun protection you are actually getting. The solid option would be a better option over the mesh one for this reason. It also is the sort of hat that would take a little longer to dry which can be uncomfortable and not ideal for sun protection, and was not UPF rated. For this reason this hat came in at 5th spot on my recommendations. Get JFH Wide Brim Bora Booney Now! I wrote this article for the dads, sons, brothers, boyfriends and husbands (and everything else in between). I know it can be so daunting hunting down the perfect sun hat when there are so many features to consider, do you need them all, what ones are most important? I hope this article helped you answer some of those questions you may have had! 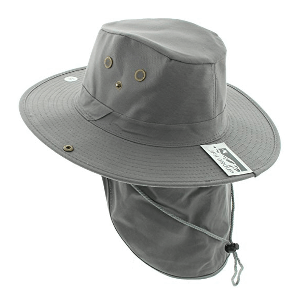 SimplySunSafe recommends the Columbia Sportswear Bora Bora Booney II Sun Hat as the best hat for sun protection for men. After researching the best men’s hats for sun protection I just couldn’t go past this hat. The features and the price point meant that is really is the best pick. If you like another style, then definitely pick one of the others, it really is your choice, I have hopefully covered something for everyone. Always remember when out and about that a hat is not your only weapon against the sun’s harsh rays. Sunscreen and hats together provide you with an amazing line of defence when outdoors. To answer any questions you may have on sunscreen the Cancer Council provide some great information. I love hearing from you guys, if my article helps you make a decision, or if you find another option you think is better please let me know about it in the comments. I love updating my guides and undertaking research to ensure I am I am up to date with all things sun hats!